Exposure to laparoscopic surgery during medical school has increased over recent years. The Fundamentals of Laparoscopic Surgery (FLS) simulator allows for objective assessment of laparoscopic skills. 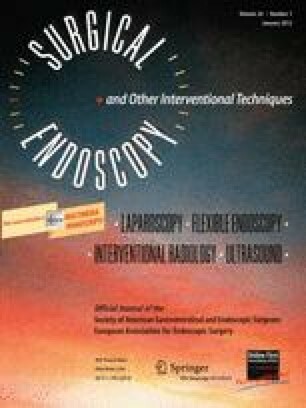 This study aimed to determine whether the fundamental laparoscopic skills of incoming surgery residents have improved. The initial FLS performance of first-year residents between 2003 and 2008 was identified from a prospective database. Linear regression was used to determine the effect of incoming year on performance of the five FLS simulator tasks (peg transfer, pattern cut, endoloop placement, suture with an extracorporeal knot [EC], suture with an intracorporeal knot [IC]) and the total score. Statistical significance was defined as a p value less than 0.05. A total of 63 first-year residents were identified from the database. The total FLS scores improved over time (r = 0.39; p = 0.001). The scores for peg transfer did not change significantly, but the scores for pattern cutting (r = 0.37; p = 0.002), endoloop placement (r = 0.36; p = 0.004), suture with EC (r = 0.32; p = 0.02), and suture with IC (r = 0.26; p = 0.03) all improved significantly over the 5 years. The baseline fundamental laparoscopic skills of incoming surgery residents appear to have improved over time. This may be due to increased clinical laparoscopic exposure and availability of laparoscopic simulation in medical school. Presented at the 2011 SAGES Annual Meeting, March 30–April 2, 2011, San Antonio, TX. We thank the residents who participated in this study. The Steinberg-Bernstein Centre for Minimally Invasive Surgery and Innovation receives an unrestricted educational grant from Covidien. Nicoleta O. Kolozsvari receives salary support from the McGill Surgeon Scientist program. Nicoleta O. Kolozsvari, Pepa Kaneva, Melina C. Vassiliou, Gerald M. Fried, and Liane S. Feldman have no conflicts of interest or financial ties to disclose.